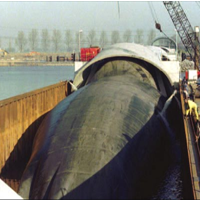 The design/build engineering company Hollandsche Beton-en Waterbouw bv (HBW) investigated and validated the concept of a new, very large, inflatable dam with the help of MSC.Software Professional Services and products such as MSC.Marc. Using MSC.Marc nonlinear simulation software, HBW could understand the dam’s performance and the inflation/deflation procedure, as well as ensure that stresses were within the specified margin of safety. Thanks to the implementation of VPD tools, HBW realized design improvements in the inflatable dam’s flexible structure and completed the design. 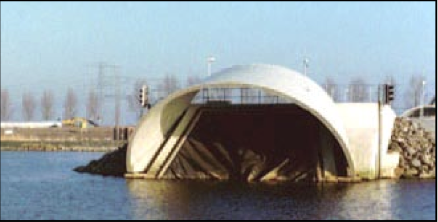 When a heavy storm hit the Netherlands in 2002, HBW’s dam automatically deployed within one hour -as predicted by MSC.Software tools. Because an inflatable dam of this size had never been built before, the concept had to be validated before it could be built. MSC Software Professional Services was engaged to investigate the concept, as well as to make design improvement recommendations, using MSC Marc nonlinear simulation software. The simulation performed by MSC Software Professional Services gave the customor as well as the government of the Netherlands an accurate prediction of the behavior of the rubber dam.